Postcards are an inexpensive way to get an immediate message to customers. When they arrive in the mail, there’s the message – no envelope to open! First-Class Mail postcards are a great value, too. With First-Class Mail postcards, you pay a low price and get all of the benefits, like forwarding and return that come with First-Class Mail. If your mailpiece does not meet the dimensions above, then the Postal Service considers it a letter and letter-size postage is charged. With Standard Mail, there is a little more Flexibility – there is no separate (lower) price for postcards, so you don’t have to worry about your postcard being to big – because you’re paying letter prices anyway. But make sure that your postcard is no larger than 6-1/8” x 11-1/2 x 1/4" thick. Mailpieces larger than any of those dimensions and you’ll have to pay flats (large envelope) postage prices. You probably have a picture in your mind of what a “letter” is. Possibly you’re using a standard no. 10 for your letter, so that’s easy to picture. However, if you decide to create a mailpiece with its own special envelope or if you are designing a piece that will be folded to letter-size, be sure to keep in mind the following size requirements for letters. You can fold sheets of paper to form letter-size pieces or newsletters. Folded pieces, or folded self-mailers, can save time and money because you’re not paying for or stuffing envelopes. Folded self-mailers must be sealed or they will be subject to the nonmachineable surcharge. We recommend that you use wafer seals or tabs to close the open sides of folded mailpieces. Have one dimension that is greater than 6-1/8 inches high or 11-1/2 inches long or 1/4 inch thick. 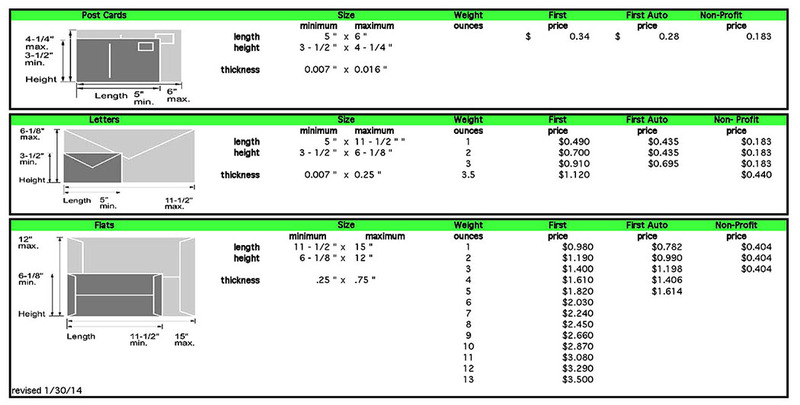 Be no more than 12 inches high x 15 inches long x 3/4 inch thick. The maximum size for a flat provides plenty of room to put lots of material in the envelope. But keep in mind that weight usually affects price –the higher the weight the higher the postage, especially for First-Class Mail. What percentage of the budget is set aside for mailing your project? Is your mail time-sensitive? Does the size, shape, or weight of your mail create any restrictions on how it can or cannot be sent? Is it important for you to keep track of returned mail and change of address notifications? These questions will help you to determine the most effective way to send your mail. Solicitations and advertisements may not be included on any area of the mailing – requests for funds, volunteering, petitions, or attendance are not considered solicitations. The incorrect placement of the address (due to design) may render a piece non-automated or nonmachinable please be sure when designing your mailpiece we have a correct clearance for printing. Mail is wrapped or bagged Mail contains clasps, ribbons, buttons, etc. 1) Folding a flat and mailing it in an envelope as a letter can help you save almost half in Standard mail. 2) Focus on Shape! Rectangular pieces with an aspect ratio of 1.3 to 2.5 will mail less expensively and more efficiently. 3) Make sure your mailpiece meets the minimum thickness requirement. Thin, flimsy pieces tend to get caught in mail processing equipment. Correctly prepare your mailing list to decrease processing time, ensure delivery, and maintain privacy. Lists must contain a header, identifying the corresponding information in each column. Separate lists by delivery location – Station B, 17, Peabody, and US Mail delivery. Never include Social Security numbers! Remember that, generally, the maximum number of lines for window envelopes is 5. To protect your mail recipients’ privacy, all submitted lists will be reviewed for unidentified fields and unnecessary personal information. Please do not send lists that contain collapsed/hidden columns, as Vanderbilt Printing Services expands all fields during processing – personal information must be DELETED off data before we receive files. No other information (building name, street address, etc.) is necessary. For further information, please call 936-4544 or send us an email at printingservices@vanderbilt.edu. For additional information on Vanderbilt’s campus mail system, please visit the University’s Mail Services website or theMedical Center’s Post Office website.